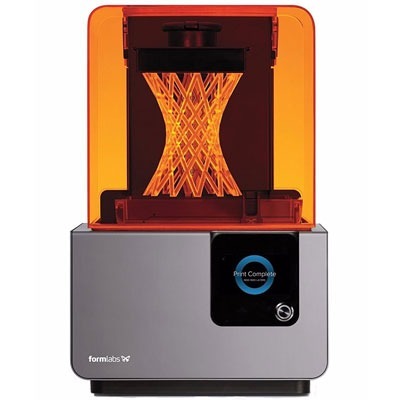 Resin 3D Printers (DLP / SLA 3D Printers): The world of today is a world of innovation and creativity. Today, mankind’s restless mind is achieving the impossible and has been able to imitate nature and other life-bearing elements present in the environment around us. Likewise, 3D printing is capturing a lot of attention and is providing remarkable services in the field of arts, medicine, engineering and other disciplines known to mankind. The technology that drives these printers is known as Laser-Based Stereolithography or SLA and the latter being Digital Light Processing or DLP. Countless researchers suggest that there is nothing new about 3D Printing Technology and that it works on the same principle but the output produced by these printers is remarkable. Here we are going to look at Resin 3D printers, but first, we must know what DLP and SLA mean and what is so different between the two types of printers that we have at hand. SLA 3D Printers use two motors on an area called Galvanometer or Galvos. There is an X-axis and a Y-axis. The method helps a laser beam to aim across the area where the print is supposed to be attained and to create a structure the resin as it goes with the printing process. This allows the design to break down as layers and as points and lines which are provided to the Galvos as coordinates. DLP, on the other hand, uses a digital printer to flash out an image of each layer throughout the platform at a given time. There are square pixels that make up the entire layer. This provides users with a layer that comprise of small rectangular bricks called voxels. As far as the processing speed of the two different processes is concerned, DLP comes up to be the fastest as it is capable of printing at a faster pace. This is because all the layers are exposed at all times during the process when it is being drawn by the laser. One should know that the printing time is applied in two instances. This means that large, dense printing jobs the print fills up the larger area of the platform as each layer will be exposed to it and there is no laser involved to draw the object. The second instance is meant for objects that are smaller in size and has fine detailing. Projector lenses swap out according to the area required for the build and uses a narrow light that is capable of building small sized layers at a rapid speed. This is how both instances differ from each other. Resolutions and surface finish is remarkably done via fast-paced DLP printing capabilities. Keep in mind that DLP 3D printers do not have the capacity to print the High-res parts that are part of a majority part of the build area. On the contrary, getting many detailed rings printed requires you to use SLA 3D printing capabilities which enables you to stay consistent as a high-resolution finish is needed on the whole area. DLP printers work best when they are required to work on small and highly complex parts and also for printing larger parts that don’t require much detailing. 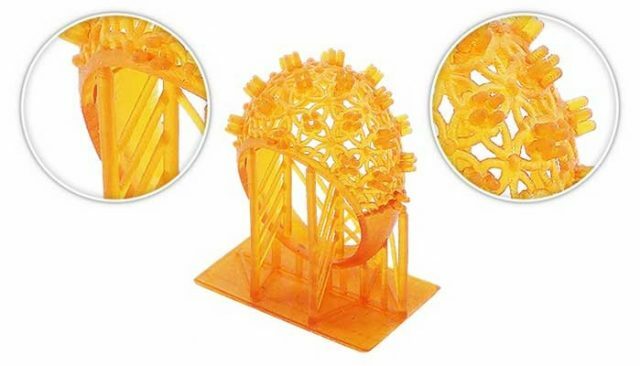 Likewise, SLA printers work best when you require printing of many small complicated parts or objects at the same time and to obtain large prints come out in detail as output. Now let’s take a glance at Resin 3D printers, their types, specifications, features, and capabilities. This Resin 3D printer is a desktop DLP 3D printer designed by Wanhao Duplicator 7. It gets you a build are of 120x70x200mm and is capable of 35 microns for a layer resolution. The technology it uses comprises of vat photopolymerization 3D printing technology and it cures liquid resin layer by layer to get an object have a final shape. 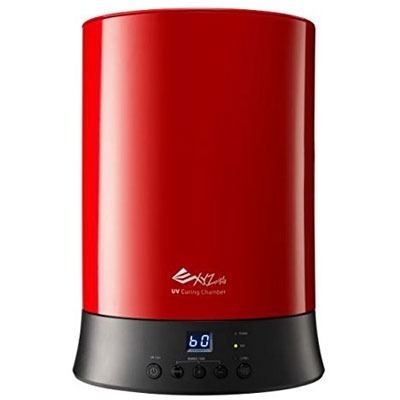 The printer has a wavelength of about 395-405 nm and is compatible with the various resin material that you can find in the market conveniently. Also, there is an HD LCD screen that offers a resolution of 2560 x 1440 pixels. It uses HDMI for input. The build speed offered by the machine is 15mm to 35mm an hour. 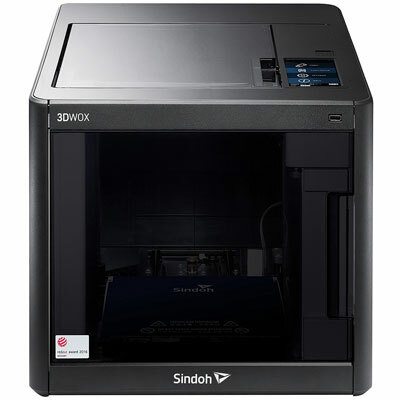 The Sindoh 3DWOX DP200 3D printer comes up with a closed structure and a mechanism that helps the temperature to remain stable at all times. This is meant to provide users with safe user experience and performance with less or no noise. The design is meant to keep the temperature to remain consistent throughout and provide users with superior quality prints. Also, great stress has been put on the overall structure to provide users with a safe operating life of the machine. To accomplish this, the parts are capsulated inside the structure. The closed enclosures help the machine to produce less noise and the users to have an optimal printing experience. Also, it is very convenient to use and goes through a simple process when you’re printing as it comprises of an auto-loading filament feature, which helps keep the machine stand out of the crowd. Moreover, the printer has a process that helps you change the filaments and helps you go through different operations like cutting, retrieving into small openings. The printer is easy to use and gets you through a simple process as it auto loads the filament. This is the Forte of this printer. Other processes involve changing filaments and a lot of complex processes. These difficult processes are handled on a manual basis. There is a high chance of error. 3DWOX printer offers needs you to just insert the cartridge. This amazing 3D printer offers remote monitoring feature as well. So in this way, we can monitor the processing. Combining the latest technology and innovation, the printer contains a 5” touch panel and a GUI that allows users to get full control of the printer and a much useful and user-friendly way. This is an SLA 3D printing hardware that comes with a lot of amazing and extraordinary features. The specifications and features built in the printer are embedded to fit the user’s needs. By utilizing stereo lithographic capabilities to print the object and gets photopolymer resin via UV lasers being an SLA 3D printer. 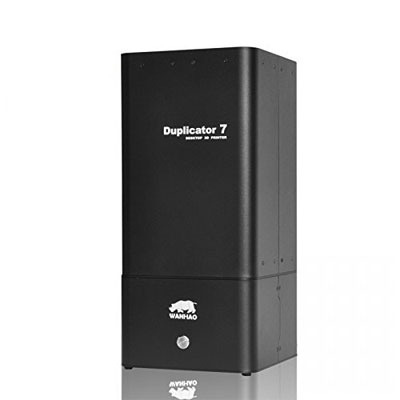 It can print in 25, 50 and 100-micron resolution and comes with automatic resin refill capability. Also, there is a USB drive that is included with the printer in which XYZWARE Nobel CAD software is also included which you can load .stl files and inspects them according to printing and adjust the model’s layer and size. This is by far a more compact and simple device that comes with a 360-degree roundtable, a mirror and the capacity to cure prints that go up to 7.1 x 7.9”. The UV light at a frequency at 370-405mm and a 360-degree curing are simply superior. This is a 3D printer that comprises of a powerful optical engine. a 250mW laser which is controlled by a custom-made galvanometer. It gets you to print larger objects. The printer also offers a thickness of 25-100 microns while the volume of the build gets to 145x145x175mm. The laser spot is 140 microns in size and gets to a 250mw power. The machine is designed to craft with precision and an accurate and reliable output and the heated resin tank that creates a reliable print all the way. The 3D printer is ideal for bigger prints as the new system and capabilities offer larger outputs. Cartridge IDs allows users to work as a tracking device of resin supplies and other options let you examine 3rd party resins. The machine is user-friendly and provides users with control of the device. 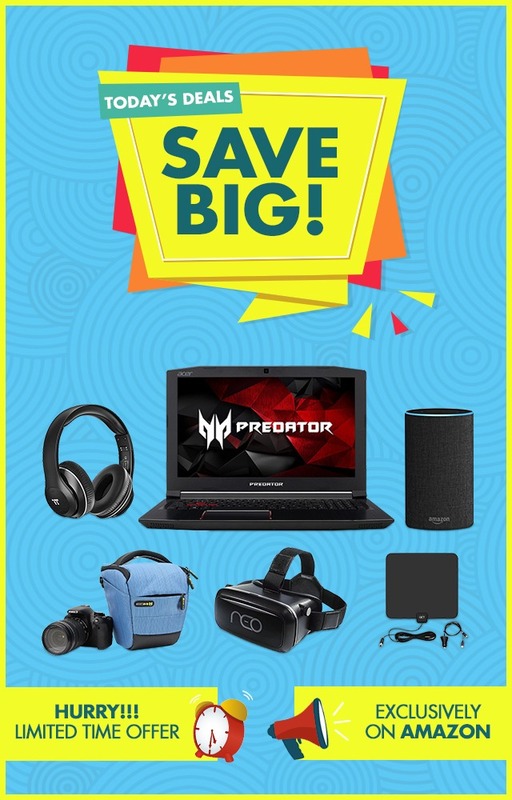 All of this and a lot of amazing capabilities like wireless connectivity and others are included in this package. So what do you get when you buy the device? In the current era, 3D printers have been successful in capturing the attention of a wide audience. People who can benefit from this marvel of technology. It has not been able to cater the needs of a domestic user, but also users belonging to different industries. This can prove to be the revolution and a way that gets more opportunities for patients who would want their organs replaced, innovators who seek customized mechanical parts, people to get low-cost ways to get complex and difficult to obtain machine parts and for the domestic user to make life easier and more enjoyable. 3D printers are an important need for every home and every industry that exists in the 21st century and beyond. However, more improved mechanics are yet to come that can help create more capable, cost-effective and advanced 3D printers so that they may produce more efficiently and effectively.